The sun is promising to shine for the May Day long weekend just around the corner, so you may be needing some extra salads on hand. This salad is chocked full of nutritious ingredients. It can be made ahead of time and it's big enough to take to any potluck. It's an all time favorite in our home and promises you a crisp texture with a crunchy bite. 1/4 cup toasted sesame seeds. In a large bowl toss first five ingredients. You can prepare this ahead of time. Combine dressing ingredients in a bowl and mix well. Tip: I usually roast large amounts of almonds and sesame seeds so that they are always available. I roast them at 350 degrees for up to 10 minutes stirring frequently so they do not burn. Bag them and put them in the freezer or refrigerator. This is one of my favorite salads! Thanks for posting! I came over from Pondside to let you know she is doing a giveaway of your book. Judging from the recipe, I have a feeling yours is a good one to have! Pondside says this book is great. Therefore it must be. Your recipe sounds delicious. I have my fingers crossed to win this book from Pondside. I love to cook! Marg - this is one of our favourite salads. I've never added the Bok Choy - that's such a nice addition! Great tip to roast the nuts in large batches. Thanks. Oh my, this salad looks wonderful! I would love to try it. Thank you for all of your marvellous recipes. I came over from Pondside because I want to win your cookbook for my niece who is getting married this summer. We grew Bok choi last year and it was very good in stir fries. This looks like a lovely recipe. I so hope for a chance to win the book. My oh my, does that look delicious! I am visiting Via Pondside as well . . . hoping to win a copy of your newest book when Ms Pondside draws the name on Sunday! Found your blog through Pondside who is generously having a giveaway of Celebrations (such a gorgeous cover)♥ My son would love this recipe! The Japanese salad looks so refreshing and what a treat when the gardens are producing fresh greens. 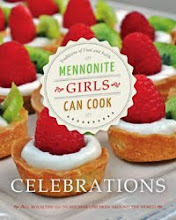 Visiting you from Pondside's blog and reading about how wonderful your Celebrations cookbook is. I really like that you added several photos of the ingredients today! 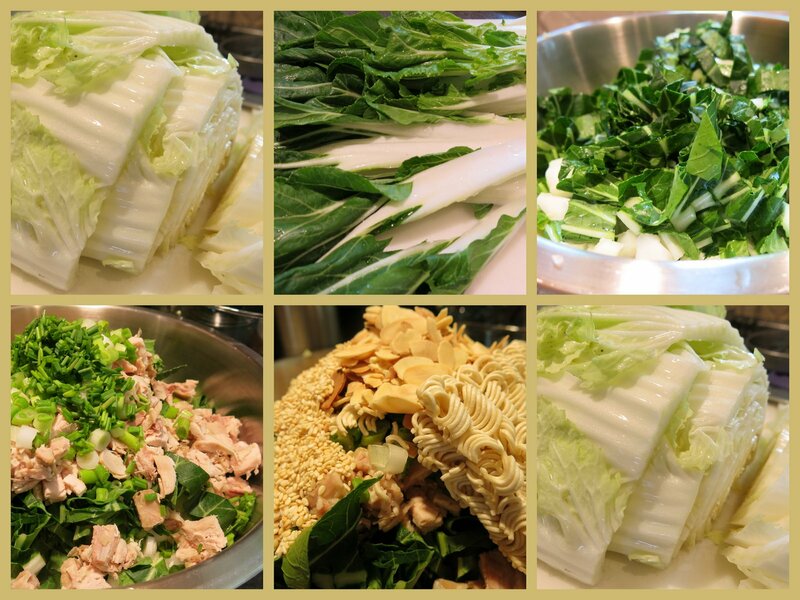 Because some of those items (such as bok choy), are not usually grocery items for me. Thanks for the alternative spices. This type of salad just has far to much sodium for it to be considered anything but healthy. Please consider using something else for the dressing and those nasty noodles. Otherwise the salad looks very good. so nice of pondside to sponsor a drawing. my first visit to her site. I come here often. not so fond of the uncooked ramen noodles. I wonder how that recipe got started? 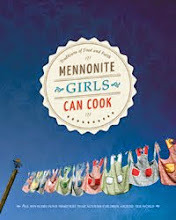 I just came from Pondside's blog, as she is hosting a give-away of your cookbook & I never even knew you gals HAD a blog!!! I've been aware of YOU & your cooking for years but never visited your blog. I'm so glad I did!! Oh goodness! I am hungry for this salad! 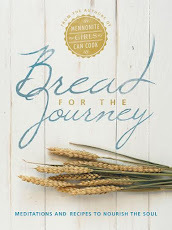 I am stopping by courtesy of sweet Pondside who is hosting her giveaway of your cookbook! I am so happy she sent us here! I love the recipes and thank you for sharign with all of us. Have a wonderful weekend. This sounds like a great recipe that I'd like to try. I came here via Pondside and I wish I'd seen this recipe earlier. We are having a family reunion on Saturday and I made the old standby potato salad today. To think... I could have made this! Oh well, there'll be another occasion! I know your cookbook is wonderful! I'm visiting from Pondside, too, to let you know she is doing a giveaway of your book. Judging from all the recipe here, it's going to be a great success! Hello, Well, I'm not from Pondside! Can you tell me more about the oriental noodles? Is it like Ramen noodles sold in the US? Yes, they are similar to the Ramen noodles. They need to be uncooked in order to enjoy the crunch.